Good. 0552993697 the cover is diffrent to the one shown. I have read this book at least three times. The last time I read it in its entirety was during a very difficult time in my life ? a period in which I was wandering in the ?dessert? ? uncertain of my purpose in this life. I was not, at that time, a believer. I was a ?physical? Christian, by which I mean that I attended church, talked like a Christian ? and, to an unbeliever, I ?looked? like a Christian ? but Christ did not have my heart. This book, however, spoke to me ? deeply ? it offered the solace and encouragement that I was lacking. It reassured me ? without spoiling the end of the story ? that there is a purpose for every life ? a Divine Purpose ? one that is pre-ordained ? and that we must, everyone of us, be patient in waiting. I had not thought about Owen Meany for nearly 12 years ? until this day ? a day in which I find myself again lost and wandering ? looking for clarity of purpose in this life. I am lost because I am out of work ? searching for a job ? and living in a culture in which we are defined, measured and valued by our work. No work ? no value. Of course, I know this is not true, but it is a culturally imposed judgment that anyone who is unemployed ? especially the long-term unemployed ? experience daily and feel deeply. We are the new lepers. In the times of Jesus ? lepers were feared and shunned ? they were misunderstood and thought to be cursed ? many feared ? contagious. Attempts were made to explain it away; those who were not afflicted could feel exempt, beyond the reach of the afflicted. So too, are the unemployed ? everyone fears the loss of their job ? some so deeply that they are afraid joblessness is contagious ? spread through extended contact. Explanations are created to help define the reason for joblessness ? laziness primarily - to make others feel that they are beyond its reach. So what does this have to do with Owen Meany? His is a story of a life lived in the face of extreme disadvantages ? poor family, difficult upbringing, multiple physical deformities ? really, no advantages in a world fixated on physical prowess and pedigree. Yet, he knew from his youngest days that the Lord had a plan for him ? that there was a Divine reason for everything he endured and his every attribute. He believed, completely and totally, that every single thing about his life had a purpose ? he simple needed to be patient, and listen prayerfully, for it to be revealed. This is true for all of us. The unemployed, poor, hungry, homeless, mentally ill, abused, imprisoned ? you name it ? so many of us are experiencing hardship that is beyond our understanding. This is made especially difficult, because in the midst of our trials ? so many are thriving ? experiencing material and other gifts that we can only dream of. I read, underlined it and prayed on those very lines. I was feeling discouraged, dejected, frustrated ? lost. Then, two hours later a took Owen Meany off of my bookshelf, opened to the first page and saw this very verse ? and I remembered the encouragement and comfort I found in the story of Owen Meany. This is an incredible book ? an incredible journey. It stands as a great reminder that the challenges of this life serve to forge, mold and shape us, it is through prayer and perseverance that we endure and emerge victorious. Today, with my bible this time, I am going on that journey once again ? I can?t wait. This is one of my favorites from John Irving. 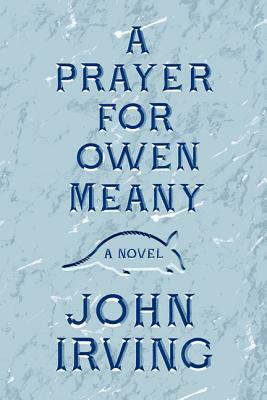 John Irving is one of my favorite authors, and A Prayer for Owen Meany is one of his best. The story is touching and sad and funny, and I think you'd have to have ice running through your veins if you didn't find it moving. OMG!!! This is a GREAT book!!!! All I can say is WOW. The title didn't mean much to me at first and it sounded like some sort of annoying "yay-religion!" book--I only read it because it was AP English Language and Composition summer homework. But this book is SO MUCH MORE! I can understand why my teacher assigned this book. The title has great meaning (which I won't tell you since it'll ruin the book) and it has significant symbols and motifs. I was very relieved that it wasn't a "yay religion!" book, but rather a book about Owen Meany's faith in his God. The details and dialogue are splendid. John Irving is really a great story-teller. Is it a good sign when a book makes you cry every time you finish it? I mean, I'm a man, and we're not supposed to cry over books. Chuckle, maybe. Cry, never. And yet every time I've read A Prayer for Owen Meany (and I've read it 4 or 5 times), I weep. What is it about this book that makes it so emotionally effective? Perhaps it's the richness of its tile character, Owen Meany. Owen, whose every line in the book is printed ALL IN CAPITAL LETTERS, to indicate his unearthly speaking voice, is one of the most engaging and well-drawn characters in American literature. Of course, the book also features a host of other interesting players: Johnny Wheelright, the narrator of the book; his mysterious and charismatic mother; his sometimes overbearing but dignified grandmother; his stepfather; Johnny's three rambunctious cousins; the town's two most prominent ministers, one Congregationalist and one Episcopalian; the list goes on. But Owen is the most significant of them all, looming large over all the others, despite his diminutive size. Perhaps the historical backdrop of the Vietnam War (and its echoes in today's world) contributes to the overall impression of a book rooted in the real world, even though many of the events that occur over the course of the story seem almost unearthly. Perhaps the flow of the story seems so natural, that it is one that I find very easy to read, despite the novel's length. I think, however, the thing that keeps me coming back to A Prayer for Owen Meany is that this is a book that, once I begin to read it, grabs a hold of me and doesn't let go until the end. It did it on the first reading, and has done it on all successive readings. This is a tale that has a firm hold on my imagination, my interest and my emotions. If I could give it more than five stars, I certainly would, because this is a book that exemplifies everything that makes reading enjoyable for me.